This is the new website for Pop Toss, the 21st Century Batting Tee, built by Nextwave Concepts. It was designed to be responsive, mobile-friendly, and search engine-friendly. We hope you find this website informative and easy to use. In addition to web design, Nextwave also provides search engine, ad management, and social network management services. Required little to no instruction to use, and provided loads of hours of entertainment with friends. If you like playing catch even a little, this product is a must have! Great weather here today, overcast and mild. Great day to try out different techniques while using my Pop toss. I found out what works and what doesn't in bp with my pop toss. It's not perfect but it's really great! Did 4-5 rounds with about 25 balls. Absolutely love it! Bought it around 6 weeks ago. Pop Up Tee is Awesome! I bought this tee from the actual website: [...] This batting tee is phenomenal. Talk about the best solo batting practice partner. I've had friends come out and throw me batting practice and there is always a fear behind everyone's mind about hitting up the middle on accident. I wish I had this tee years ago. Cal and Pat are the owners and the customer service they provide is probably one of the best! Emails are answered in a timely manner and the ship replacement parts when they say they will. 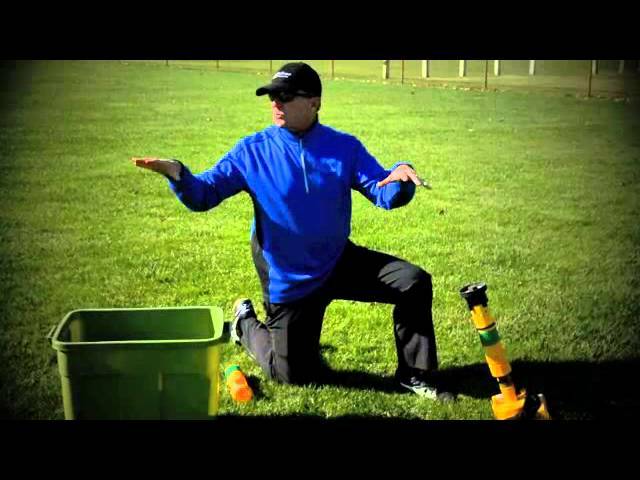 This is a great training aid for hitting a slow pitch softball. It really helps with practicing those ball placement swings. Best thing I've EVER done for my game! This is a fabulous, fabulous product and this company has the best, REPEAT, the BEST customer service on the planet. Buy thus product NOW and you'll be as excited as I am to own one! Thank you Pop Toss! Thank you, thank you, thank you! I hit with it and people ask me what it is, I always give them the flyers you sent me. Thanks a lot! Love using the pop toss so much. It recently helped me win an MVP award at a high arc tournament. The hours of practice really paid off. I was skeptical at first, but I thought I’d let the kids decide. Awesome, just awesome! The kids love practicing with it and I saw an immediate improvement in the teams ability to hit line drives all over the field. Thanks. Pop toss batting machine is awesome! I use it for slow pitch softball to keep my swing in tune, and they even sell a weighted bat with 3 different weights what is a must-have. I recommend both! My son loves his new tee, I’m thinking of getting one for my Slowpitch team. Just wanted to say thanks again for your generosity and for all your hard work for the game! I'm in a number of softball discussion pages as well as some b/s/t ones, on Facebook, with people from all over the country/world. I just saw this evening, a guy posting about posting a green tee after seeing me use it on the videos, and talking about how much he loved it. It was cool to see him rave about it and hear other guys inquire about it or talk about how they've been thinking about getting one. The guy also stated how great of customer service you all provide. I hope you find all that encouraging. You've made a great product and people are impressed when they work with you, as I can confirm! I also heard back from my old college coach recently, saying he loves the weighted bat and has been using it at the academy. We agreed to try and connect in either February or March to do some form of an interview for a video on his experience. I need to follow up with the UWM coach, especially as their season is about to enter games here - at least for an initial check in. As for the 2-in-1 I've been swinging, the thing is a tank. Still going strong after thousands of hits. The long rod is still holding on since I put that layer of plumbers tape on it. And the swing is getting stronger!! Come on warm weather HAHA! I am a competitive senior softball player. My poptoss is 4 years old and has had thousands of reps. It has done everything I expected it to. Poptoss customer service is excellent. They respond quickly if you have questions or need new parts. Your poptoss tee will give you great and reliable service for a long time if you take care of it. The most important thing to remember is to always have some protection in front of the tee. Also the tee performs better and stays cleaner if you set it up in grass. I use my PopToss about 200 times per week so it gets good use. I just came back from the Senior Softball 50 Major World Championships in Las Vegas this past weekend. My team won the championships and I was fortunate enough to win team MVP… without my PopToss this would not have been possible as I don’t have a batting practice partner that I can rely on all the time. I can rely on my PopToss though… I believe I finished with a .892 batting average and again would not have been possible without my PopToss. This thing is awesome, such a great tool for hitters of all ages. And the customer service is amazing had a few questions/suggestions, and was responded to by a live person and was very awesomely taken care of, by far the best customer service experience I have ever had. What an awesome product, my son loves using this. real user, customer and player! i saw this device on youtube and i couldnt wait to buy it. ive always had trouble finding people to practice due to my crazy schedule but i no longer have that issue. from the first day i tried it i loved it. great for working on your hand-eye cord. and timing. after about 400 hits the machine started malfunctioning (wouldnt hold the air timing down) so i called the the 800 number on the device. i spoke to a woman named pat and all i can say is GREAT customer service. i told her the problem and she shipped me timer, base, spring, and striker free of charge within 3 days. while waiting for the new parts i tinkered with it a little and found the problem. opposite of the timing mechanism theres a little valve that opens when air is pushed out and closes as it sets the timer. a piece of trash had gotten in there and was messing up the timing. once i removed that i was good to go. ive put another 400 hits and hasnt missed a beat. one thing i do recommend is keeping it well lubricated. after every batting session i put a little grease on the o ring located on the striker and i rub a little motor oil down the main shaft were the striker travels. one last thing, the base is a little light so when the striker launches the ball it slightly hops so you need to adjust it frequently.i fixed the problem by zip tying it down to and old baseball tee base. Very impressed. If it broke today I would buy another. Great product. Better customer service. I don't normally review things on Amazon but felt compelled to leave one based on my positive experience with this company. Note I am talking about 21st Century Batting Tees the company which makes the Pop Toss, not the distributor. I have owned a Pop Toss for about a month and a half and I love it, it has helped my hitting immensely and it's really easy and fun to use. Unfortunately my dumb friend managed to break it during practice and the plastic top funnel became cracked and useless. Now I found out via the Pop Toss website that they have a lifetime warranty for every Pop Toss they sell. I spoke on the phone with them and they asked me to e-mail pictures of the damage. Less than 24 hours later I got an e-mail back saying they would ship me replacement parts. They sent me TWO complete replacement funnels and fixing it could not have been easier. I am HUGELY satisfied with the Pop Toss but I was moved to write this review based on my experience with the company. Highly recommend. Just wanted to say how impressed I was with your customer service! Got my replacement parts within a couple of days and have been back out to the fields to work on my swing, thank you all so much! I gave this to my husband as a Christmas gift and he is just now getting to use it. He LOVES it. It works great! Fantastic product and customer service. I've been using their poptoss for about 10 years. I have mine mounted on a 25 lb weight attached with a bungee cord in a tall recycling bin (to protect the machine). Very consistent and the newer one shoots the ball further. Do a few swings of live pitching before a game though.